We are Andy Royston and Jackie Jackson – together we are Tropical Sun. We’ve both been designers for many (many many) years and we love what we do. Tropical Sun is a relatively new venture though. We decided to form Tropical Sun so that we could concentrate on the projects we really love. We live and work in a small, mid-century, waterfront apartment on the Las Olas Isles in Fort Lauderdale, which we love. We’ve done the whole office thing and these days, we prefer to be environmentally-friendly and keep our overheads low. (Which is great for our clients too!) We work in jeans and t-shirts and 99% of the time we don’t even wear shoes. If we get a creative block, which rarely happens, all we have to do is look out of our windows at the tropical foliage and the boats going by. If you drop by for a client meeting, come in shorts and a t-shirt; we’ll discuss your project on the dock sipping a beer (or one of our huge selection of herbal teas if you prefer). Our day starts before dawn. It’s easy to get up early when you know that your day is going to be spent in a wonderful place and that your work will be something you really want to do. Every morning, yes every morning rain or shine, Andy leaves the island and drives the mile or so to the beach. While he is taking his morning walk, he uses his iPhone to capture the dawn, the rising sun and the wonderful world of Fort Lauderdale beach. These photographs are shared in real time with his social media followers all over the world. Andy has a huge reputation as an iPhonoegrapher. He is in great demand as a lecturer on the subject. Meanwhile, Jackie is at her computer, sending Andy’s images to various social media accounts she runs and probably researching something-or-other to do with her own passion, the history of Las Olas Boulevard and our wonderful area. These two passions have led to several books – the first series by Tropical Sun. Let me tell you why we chose Tropical Sun as our company name. It seemed like a great idea to incorporate the word ‘sun’ into our name, especially due to Andy’s dawn activities. And Jackie, during her research, found that the first newspaper in Fort Lauderdale was called the Tropical Sun. What a great way of combining their two interests. After Andy’s beach excursions, he calls in to a Las Olas bakery and buys a freshly-baked French stick. That’s for lunch later. Is this an idyllic life? Well, yes. From a child, Jackie’s stated ambition was ‘to live on an island somewhere warm, making a living designing and writing’. Why not come to discuss your project with us over lunch? One of our favorites is a mozzarella, tomato and basil sandwich – bread and mozzarella both made on Las Olas Boulevard and basil picked from just outside our back door. (Note to self – must plant tomatoes). Let’s discuss your story as we eat on the dock watching luxury yachts go by. Forget the conference room. Never mind the suit and tie. We’re in South Florida – let’s enjoy. We work at an uncluttered table right by two open large windows which let in the tropics, cool breezes and fresh air. There is always a bizarre playlist entertaining us. No-one on the planet has such bizarre playlists, I promise. Oh, and I need to tell you that we are both English. In the UK Andy started his career in the music industry, designing record sleeves which have now become iconic. He then worked for the BBC, creating graphics for their news programmes for many years, He moved to Florida in 2000. Jackie, on the other hand, has lived in Fort Lauderdale since 1994. Unlike Andy, who preferred job stability at the BBC, Jackie worked in textile design antiques, publishing, photography, health foods and in her favorite – interior design. She was the acknowledged expert on designing safe and efficient kitchens for the visually and physically handicapped. She says that she has sold everything from used cars to ugli fruit. Both Jackie and Andy have honors degrees in design. 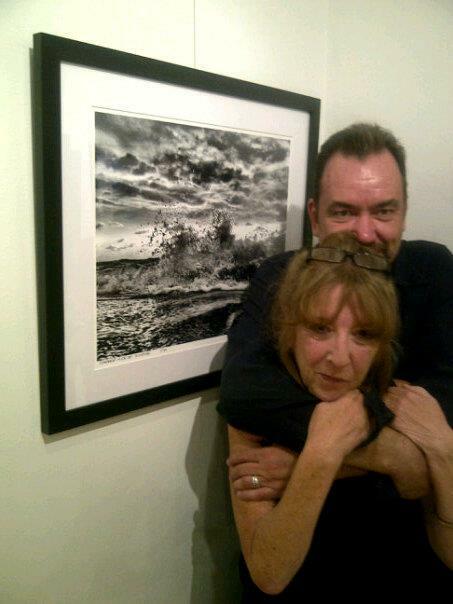 Jackie Jackson and Andy Royston at the Art4Vision Gallery. 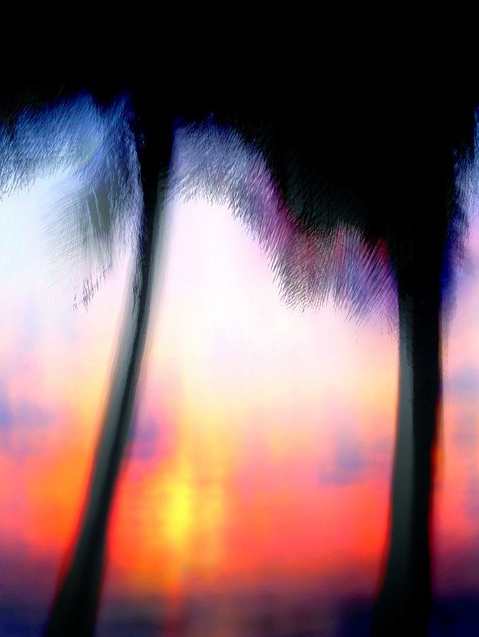 Photograph courtesy of Robin Haines Merrill of Mission Gifts on Las Olas Boulevard, Fort Lauderdale.